He loved to explore and fish his family’s property throughout his childhood. After high school Matt had to make the decision to hang up his baseball cleats and focus on school. At the age of 21 Matt knew he wanted to do something other than work for the Department of Natural Resource. That’s when RLTroutCamp was looking for someone to manage their fishing operations. 5 years ago was the first time Matt went up to Reindeer Lake and he has been back every year since. Within these 5 years Matt has been able to hone in on incredible skills of navigating and fishing for trophy pike. 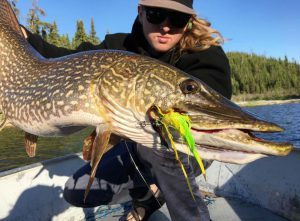 Matt will present when to visit, appropriate gear, local baitfish, and specific flies and techniques for targeting trophy pike. *Matt is also a guide at The Lodge at Palisades Creek.